Google’s note taking app “Google Keep” has now come to the Chrome web store from Android Google Play store. Using Google Keep, you can Save what’s on your mind. You can quickly save, access and organize the information you want with Google Keep. Google keep has been announced for the Android users back in March and also you can take notes using the Google Keep Web interface. This cross-platform functionality with the synchronizing option makes it a universal Note Taking App. Today Google Announced that it’s Note Taking App will be available as a standalone Chrome App for all Google chrome users and Chrome OS users. 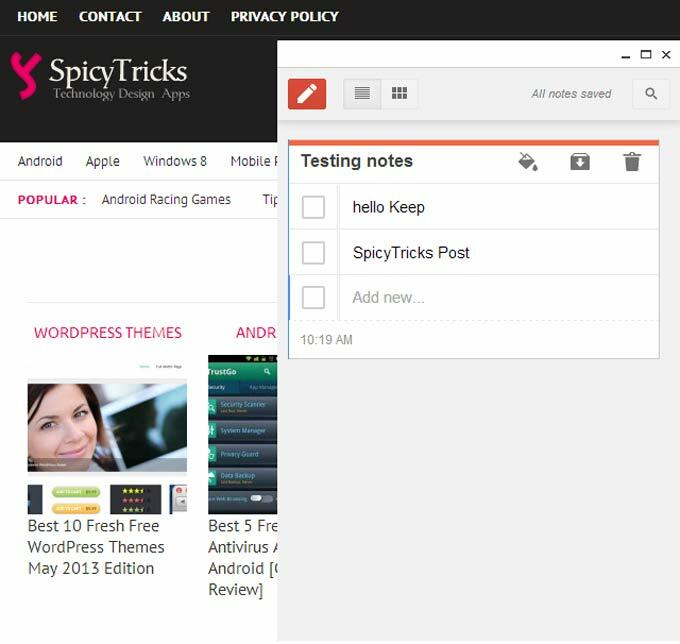 If you take notes in Google Keep chrome app, it will be synchronized in all your interfaces such as web interface http://drive.google.com/keep and your Android devices. What you can do With Google Keep? Just install this Google keep Chrome app from Google Web store. Google Keep will open its own window, you can take your notes on the fly as well you can browse the web. Google Keep also works in Offline. So If your internet connection goes offline, you can still take notes, when the connection returns, your notes will be synced to all your Devices. Before that Google released the Chrome Office Viewer Chrome App to open MS Office Word, PowerPoint, Excel directly from the browser.